I made a quick start, getting my house in at Martha’s Vineyard. I had some good furniture but no kitchen, so I found a great kitchen set (although very small, but modifiable) at What’s Next and some great snow for the roof and such too. I’ve worked on this for days and days but today I’ve declared it complete, finished for the season. My home is furnished. Winter has come. I have neighbors visiting even, so it’s now time to just enjoy till Spring. I love the way this New England islands region moves through the seasons. /me is happy. Outside, the Winter winds blow, the thermometer drops and the snow falls. There’s a moon out tonight and shadows on the snow. Inside, it’s cozy and warm and Christmasie. In the kitchen, I’ve got my Dreamgirl Cookbook open to my famous sweet potato mini-pies with whipped cream cheese recipe. The first visitors gobbled up all the first batch so I’m cooking another. Y’all come! That’s Southern for, hey everybody, come on over! You are wondering, huh? What’s a Southerner doing in New England? 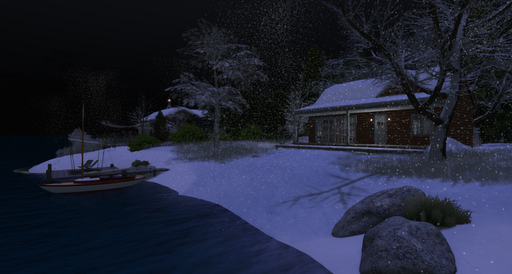 This entry was posted in Features and tagged Community, Homes & Gardens, Second Life. Bookmark the permalink.